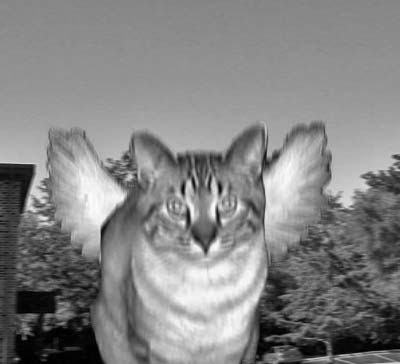 After three weeks of sightings, anonymous DuPage and Will county employees finally confirmed the presence of Chinese flying cats in the area. "These Chinese invaders could wipe out our song bird population!" Said an employee who asked to be called Joe. "Now there's no place a bird can hide from one of these monsters." The first sighting was at Lisle's Four Lakes complex. Doug Tenton was walking by The Towers apartments when something fell on his head. "It was this disgusting mess. At first I thought some hurled one me. But on top of my head, I felt this big ball fur. I looked up, and I swear, I saw this big pair of wings, like a big bird, but it had four legs! What kind of bird has four legs?" Sheila Daniels of Bolingbrook reported a horrific attack two days later. "I was watching my pretty birds in the birdbath, when a gang of cats with wings swooped down on them. My birdies didn't stand a chance! They couldn't fly away from the cat's sharp teeth and claws! It was horrible. I can't talk about it anymore!" Donna Thompson reported a flying cat assaulting her cat. "I heard Natty yowling, and ran outside. This 15-pound cat with wings was trying to mate with her. She was trying to run away, but it was too fast, and it could fly. Somehow I managed to scare it off. Then I rushed Natty to the vet. She's OK. I'm glad I had her fixed, and gave her all of her shots. Now Natty is going to be an indoor only cat. Right now she's hiding under the stairs, and won't leave. Poor baby!" The Chinese Flying Cat, first reported in the 19th century, normally lives in Western China. This very rare creature wasn't photographed until August of this year. In China, dragons prey upon flying cats, thus keeping their numbers low. China's heavy pollution also contributes to the species' meager numbers. With no dragons in the US, and our high air quality, experts fear that that the flying cat population could explode. This could result in the extermination of the songbird population. They also threaten the local rodent population, and some scientists fear the worst. "They could start eating ground cats and dogs if they deplete their normal sources of food." Said Dr. Norm Sawnson. "Then they'll move on to people. We could be looking at a swarm of flying cats that's as bad as locusts. We have to act now before Chicago turns into a scene from a Sci-Fi Channel movie!" Sources close to Governor Blagojevich say he is planning to mobilize the National Guard against this threat. His options, they say, include fire bombing the skies over Chicago. "He doesn't want flying cats in Illinois, and he will do anything to stop them." Said a source. "His response to this plague will make his relations with the state legislature seem cordial!" Meanwhile, Chu Li, a trade representative for China, denies that the flying cats are from China. "It's just a coincidence that cats in the US learned to fly and that a beetle decided to look like the Asian Longhorn Beetle. This is just anti-Chinese propaganda written by American jealous of our successful Olympics. If you don't end this interview, I will report you to your Department of Homeland Security." Until the threat is over, residents are urged to pour orange juice on their lawns to repel flying cats, because they hate the smell of citrus. If you see a flying cat in your yard, spray it with water if possible. Do not leave catnip outside. Finally, all normal cats should be kept inside at all times to prevent them from being accidentally attacked by the National Guard. Claar: I should be McCain's VP!